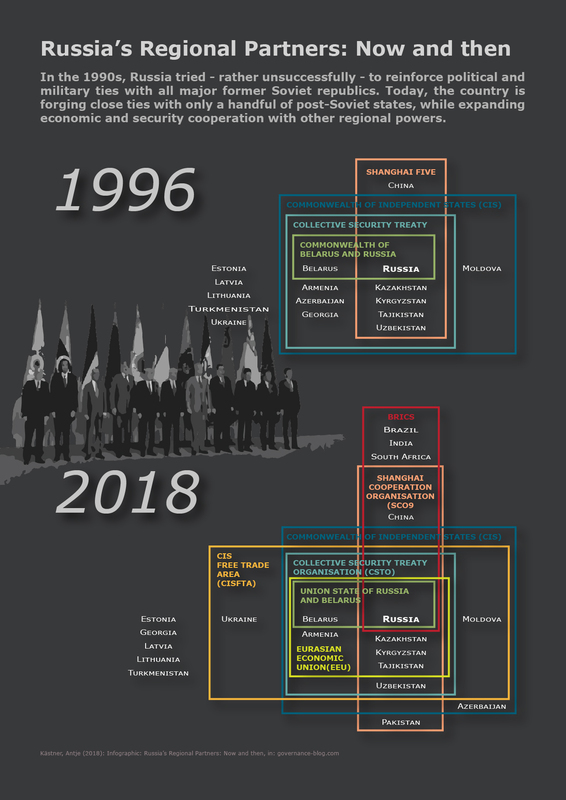 02/09/2018 0 comments on "Infographic: Russia’s Regional Partners: Now and then"
In the 1990s, Russia tried, rather unsuccessfully, to reinforce political and military ties with all major former Soviet republics. Today, the country is forging close ties with only a handful of post-Soviet states, while expanding economic and security cooperation with other regional powers. The Commonwealth of Independent States (CIS) was founded while the Soviet Union still existed, but eventually became the vehicle for the Soviet republics’ civilised divorce. In early December 1991, the presidents of the Belarusian, the Ukrainian, and the Russian Soviet Federative Socialist Republics – Stanislav Shushkevich, Leonid Kravchuk, and Boris Yeltsin – agreed to form the CIS. Stating that all the members were sovereign and independent nations, these Belavezha accords effectively undercut the existence of the USSR. At the same time, the agreement encouraged other Soviet republics in their strife for independence. Apart from the three Baltic republics and Georgia, all other Soviet republics on 21 December 1991 joined the organisation, when signing the Alma Ata Protocols. Five days later, the USSR officially ceased to exist. In the following years, most signatories of the Belavezha Accords and the Alma Ata Protocols ratified the CIS-charter and subsequently became proper member-states. Only Ukraine and Turkmenistan abstained from doing so. Ukraine was given the status of associate member in 1994 and was thereafter allowed to fully participate in the organisation’s activities. Within the CIS-framework, seven post-Soviet states decided for deeper military integration. On 15 May 1992, Armenia, Kazakhstan, Kyrgyzstan, Russia, Tajikistan, and Uzbekistan signed the Tashkent Treaty founding the CIS Collective Security Treaty (CST). Against the backdrop of the ongoing civil wars in their countries and the promise of Russian peacemaking, the governments of Georgia and Azerbaijan in late 1993 reluctantly agreed to join the CST. In this context, the Georgian government, who had abstained from joining the organisation at its inception, also entered the CIS. And Belarus’ leadership, who had initially hoped to secure a neutral status, on 31 December 1993, joined the CST, hoping to secure Russian support for the upcoming presidential election. The CST came into effect on 20 April 1994. With regard to security matters, the Russian government from the mid-1990s also engaged in a more intense regional dialogue with China. On 26 April 1996, the so-called Shanghai Five – China, Kazakhstan, Kyrgyzstan, Russia, and Tajikistan – signed a treaty on deepening military trust in border regions. This was followed a year later by an agreement on the reduction of military forces in border regions. Political and economic integration within the CIS, however, remained vague. Several governments stayed away from the organisation’s meetings. And in the economic sphere, it was the Russian government who was obstructing closer ties. Russia’s relationship with Belarus, however, stood out. In the run-up to the Russian presidential elections in 1996, the two countries’ presidents – Boris Yeltsin and Alexander Lukashenko – with great public appeal formed the Commonwealth of Belarus and Russia, which a year later was transformed into the Union State of Russian and Belarus. The Union’s most apparent achievement is that citizens of both member states can work and claim social benefits in the other country without formal immigration procedures. In view of Russia’s lacking enthusiasm to reinforce economic cooperation in the post-Soviet space, several alternative regional organisations emerged from the mid-1990s. In 1994, Kazakhstan, Kyrgyzstan, and Uzbekistan founded the Central Asian Economic Union. When Tajikistan joined them in 1998, the organisation was renamed Central Asian Economic Cooperation (CAEC). From 2002, it was known as Central Asian Cooperation Organisation (CACO). Yet, integration circumventing Russia also occurred between countries in which the Russian military had supported separatists. In October 1997, Georgia, Ukraine, Azerbaijan, and Moldova established a consultative forum named GUAM, after the initial letters of each of those countries. Two years later, GUAM was joined by Uzbekistan, turning into GUUAM. The same year, the three GUUAM-members that belonged to the CST – Georgia, Uzbekistan, and Azerbaijan – did not renew their membership in the CST. To counter the estrangement of former Soviet republics, Russia then put a stronger emphasis on economic integration. On 10 October 2000, the presidents of Armenia, Belarus, Kazakhstan, Kyrgyzstan, Tajikistan and Russia established the Eurasian Economic Community (EurAsEC). Subsequently, EurAsEC was eclipsing CACO in terms of membership and functions, even more so when Russia joined CACO in May 2004, and after Uzbekistan left GUUAM and joined EurAsEC in October 2005. By the time Uzbekistan decided to leave EurAsEC in 2008, CACO had become obsolete. EurAsEC, however served Russia to further deeper economic integration with selected members against the background of the European Union’s Eastern Partnership. In 2010, Belarus, Kazakhstan, and Russia founded the Eurasian Customs Union. Two years later, they created the Eurasian Economic Space. And in 2014, EurAsEC-members eventually agreed to transform the organisation into the Eurasian Economic Union (EAEU), incorporating the Eurasian Customs Union and Eurasian Economic Space as of 2015, and extending it to all members. In 2017, GUAM-member Moldova was given EAEU-observer status. With Georgia’s, Azerbaijan’s and Uzbekistan’s withdrawal, the CIS Collective Security Treaty in 1999 only encompassed six former Soviet republics: Belarus, Armenia, Kazakhstan, Kyrgyzstan, Tajikistan, and Russia. These six not only decided for closer economic integration when founding EurAsEC in 2000. They also opted to deepen their military cooperation. In 2002, they agreed to transform the Collective Security Treaty into a military alliance – the Collective Security Treaty Organisation (CSTO). CSTO-members subsequently conducted annual military exercises and were able to purchase Russian weapons at Russian domestic prices. In 2007, they further agreed to form a joint peacekeeping force, the Collective Rapid Reaction Force. At the same time, Russia institutionalised its regional security cooperation with China. In 2002, the Shanghai Five together with Uzbekistan founded the Shanghai Cooperation Organisation (SCO), primarily to counter terrorism, separatism, and extremism in the region. Subsequently, SCO-members conducted joint military exercises, and shared intelligence. In October 2007, the SCO signed an agreement with the CSTO to broaden cooperation on security issues. Both CSTO and SCO attracted the interest of other countries in the region. Shortly after joining EurAsEC, Uzbekistan also entered the CSTO, but left it for a second time in 2012. In 2013, the CSTO admitted Serbia and Afghanistan as observers. Meanwhile, the SCO approved of four observers: Mongolia (2003), Iran (2009), Afghanistan (2012), and Belarus (2015). In 2017, they welcomed India and Pakistan as new SCO-members. In addition to the SCO, Russia and China from 2006 sought to counter European and U.S. influence in the international arena by collaborating with two other regional powers. Brazil, Russia, India, and China (BRIC) agreed in September 2006 to hold regular high level meetings and from 2009 organised annual summits. In 2010, they were joined by South Africa (BRICS). Aiming for more independence from existing international financial institutions, the BRICS in 2015 set-up the New Development Bank and the Contingent Reserve Arrangement. The Commonwealth of Independent States over the last decade was abandoned by two former Soviet republics. Following the Russian-Georgian War of August 2008, Georgia left the organisation. And following Russia’s annexation of Crimea, Ukraine stopped participating within the CIS-format. Nevertheless, the CIS eventually made progress regarding economic integration. In 2011, Armenia, Belarus, Kazakhstan Kyrgyzstan, Moldova, Russia, Tajikistan, and Ukraine agreed to form the Commonwealth of Independent States Free Trade Area (CISFTA), replacing existing bilateral and multilateral free trade agreements between these countries. When Uzbekistan joined two years later, Azerbaijan remained the only CIS-member not participating in the free trade area. While Russia from 2015 suspended its CISFTA with Ukraine, Ukraine’s agreements with the other CISFTA-members remained in effect.